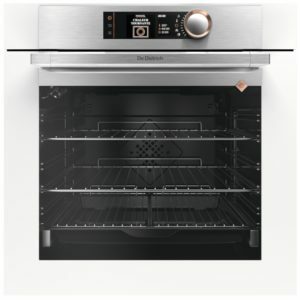 This brilliant built in pyrolytic electric multifunction single oven from De Dietrich boasts a 73 litre capacity and an A+ energy rating. It can be installed under your worktop or in a tall housing unit. It has a soft close door, 11 cooking functions, low temperature cooking , keep warm function and 3 pyrolytic options. Eliminate the need to scrub your oven again! This model also boasts defrost, bread and drying functions. This stunning oven finished in platinum will make the perfect addition to any kitchen. This brilliant built in ICS pyrolytic electric multifunction single oven from De Dietrich boasts a 73 litre capacity and an A+ energy rating. It can be installed under your worktop or in a tall housing unit. It has a soft close door, 12 cooking functions, low temperature cooking, keep warm function, pyrolytic control and 3 pyrolytic options. Make scrubbing your oven a thing of the past! This model also boasts defrost, bread and drying functions and a sabbath function. This stunning oven finished in platinum will add class to any and every kitchen. 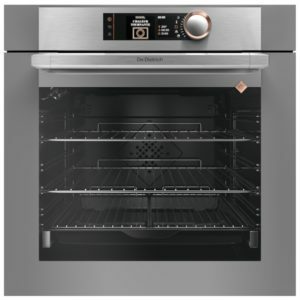 This fantastic built in ICS pyrolytic electric multifunction single oven from De Dietrich boasts a 73 litre capacity and an A+ energy rating. It can be installed under your worktop or in a tall housing unit. It has a soft close door, 12 cooking functions, low temperature cooking, keep warm function, pyrolytic control and 3 pyrolytic options. Make scrubbing your oven a thing of the past! This model boasts defrost, bread and drying functions as well as a sabbath function. This stunning oven finished in iron grey will add style to any and every kitchen. 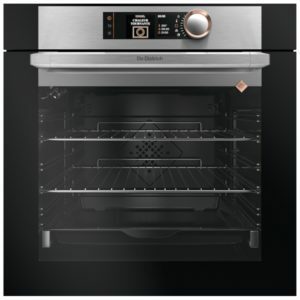 This brilliant built in ICS pyrolytic electric multifunction single oven from De Dietrich boasts a 73 litre capacity and an A+ energy rating. It can be installed under your worktop or in a tall housing unit. It has a soft close door, 12 cooking functions, low temperature cooking, keep warm function, pyrolytic control and 3 pyrolytic options. Make scrubbing your oven a thing of the past! This model also boasts defrost, bread and drying functions and a sabbath function. This stunning oven finished in pure white makes the perfect addition to any kitchen.